I give this book 5/5 stars! I loved it. While I enjoyed All the Missing Girls, I liked this one a lot more! Megan Miranda delivers a great psychological thriller that kept me looking over my shoulder. She did a great job building the characters and the mystery around Emmy and all of the events happening. We follow Leah and Emmy. Two roommates that leave Boston to have a clean start in rural Pennsylvania. Leah because of a failed career and restraining order, and Emmy to get out of a bad relationship. When a woman, who looks almost exactly like Leah, is murdered close to their home, there are a lot of questions that come up. Is it the coworker that was stalking Leah? Then shortly after, Emmy goes missing. So Leah is on a mission to find her roommate. During the investigation, she learns that everything she knew about her roommate was false and made up - from her job to her name. Investigators can't help but wonder, did Emmy Grey ever even exist? The setting for the book really helped me get that paranoid feeling. They live in a secluded area, in the middle of the woods. I live on 36 acres of woods. So that really helped grow the suspense and paranoia. Is someone watching her? The characters were well developed and Miranda did a great job with the mystery around Emmy. I loved the ending as well! It was a quick read and very enjoyable. It wasn't heavy on the police procedure either; just some of the investigation was included, but it focused more on Leah. I definitely recommend this book to those who loved All the Missing Girls! Or if you love suspense and psychological thrillers. Thank you to Simon & Schuster for the advanced copy in exchange for my honest review. 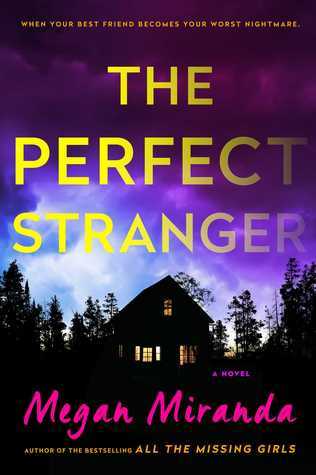 Sign into Goodreads to see if any of your friends have read The Perfect Stranger.